Day 7 we awoke in Jackson and had a leisurely morning, before heading back into the park for Cascade Canyon. This was the busiest place we had been — some of that was due to nicer weather, but some of it was due to the popularity of this hike! We made it a little over 5 miles, to just before the Canyon forks north and south. We again had a hot lunch and chilled for a bit, before heading back down. This hike gave us a little over 50 miles of hiking and backpacking! For dinner, we spoke to the hotel receptionist about some options, and decided on The Lift, a 15 minute walk towards the town ski slopes. I imagine during the winter this place is happening, but at this time a year, it’s away from the down town business, and is more of a locals place. We both had excellent meals. On the walk over we saw a glass building with all kinds of colorful florescent lighting. Upon closer inspection, we discovered it was an indoor garden, growing all kinds of vegetables on rotating shelves. Pretty cool to see! The next day we flew home. We will definitely be back to hike the Teton Crest trail some day! But we need to come in very late July or August, for that to be possible. After a night of mostly rain in Death Canyon, we awoke to a break in the weather that allowed us to have breakfast and pack up the gear. I would have been tempted to stay another day/night in Death if it had just rained, even though our permits said to move out. It was an amazing spot, and Kelly and I were the only ones for what seemed like miles. No one else was in the Death Canyon camping zone! A few minutes after we left the site with all our gear on our backs, Kelly suddenly stopped. We had scared a bear cub up a tree, less than 50 yards a way. It was really cute, and I wish I had a picture, but we were also worried as we didn’t see Mama bear. We stood very still and Kelly shook her bear bells, and after maybe 30-40 seconds, the mama appeared and ran up the hill. Baby bear came down the tree and followed. Shew! As we started down Death, it really started to rain and was really cold. It was a bit of a death march, in some ways. After an hour or two, I was getting really cold, but Kelly was marching along. I started thinking of the B&B’s hot tub. When we reached the fork in the trail at Phelp’s Lake, however, we did not turn back to the car. We headed up towards Open Canyon. After a few minutes we stopped for a warm lunch of rice noodle soup and tea, and though I was shaking from cold and wet, it made me feel a lot better. And once we started up, I did warm up. I could tell Kelly was struggling, a bit. Turns out her feet were pretty much ice blocks. After a while we did come across three back packers — they were heading down and bailing — they had had a pretty aggressive plan of much higher peaks, and just didn’t have the gear. When we found the site at Open Canyon, we set up, again just in time for a hail storm, though this one was much smaller than the night before. We did have a brief, 30 minute period of sun, where we hung up our wet clothes to dry, but alas, it got dark too soon. Day three — time to start backpacking! But only after an awesome breakfast at the B&B. Again, to keep things simple, I’m just doing a single “tile mosaic” of all the images and will write at the top what we did, but will include videos here and there as well. After breakfast, we headed into the park on Moose Wilson Road, a bit of a back door road into the park that passes by Teton Village, and then is 9 miles of tight and twisty road to the park. Before the park, though, we hit the turn off for Death Canyon Trail head. The 4×4 Jeep allowed us to drive the rough mile long road, through some major pot holes, to get all the way to the trail head. We did pass a lot of cars parked much earlier, but in reality, we saw a minivan make it pretty far. I personally would not have attempted that! The trail to Death Canyon has a 1 mile lead in to a view of Phelps Lake, and then heads up the canyon. The 1st part of the hike, we saw a fair number of day hikers, but after that, we saw a few runners and day hikers. One of the runners was wearing the same Prana shorts that I run in — something I’ve not seen before! He also had no GPS and said he wasn’t training for anything, just out running. We reached the top, where it flattened out, and we hiked along the creek with stunning mountain peaks and snow and waterfalls on each side. We saw a few moose, and very few people. One was a runner, who was wearing Prana shorts – something I’ve only know myself to do! He had no GPS and said he wasn’t training for anything, just out for a 12-13+ mile run in an incredibly beautiful place. After that, it was another mile or so until we found the perfect camp site. We were on a bit of a rock knoll — really a 3 sided cliff – with a small flat grassy spot on top. We set up the tent and grabbed a quick lunch, just before we got hit by a huge hail storm! After the hail, it did rain for quite a while, but we were lucky enough to get a short window where we could cook dinner without rain. Kelly and I celebrated 25 years of marriage by heading to one of our favorite places, Grand Teton National Park. While we had wanted to backpack the Crest Trail, we were too early in the season. The park ranges had told us we’d need to carry ice axes and know how to self-arrest! We opted to do some canyon backpacking instead — in one canyon, then out to the next. We still want to go back to do the entire Crest trail some day — but now know that needs to be mid to late July to (very) early September! We flew in to Jackson Hole and had a couple nights at a fantastic Bed & Breakfast, Teton View B&B. (When we landed in Jackso, the stewardess welcomed everyone there, but gave a special welcome to “Mr. and Mrs. Butler, celebrating 25 years…”) The hosts of the B&B Franz and Carole were extremely welcoming and have a lovely set up. 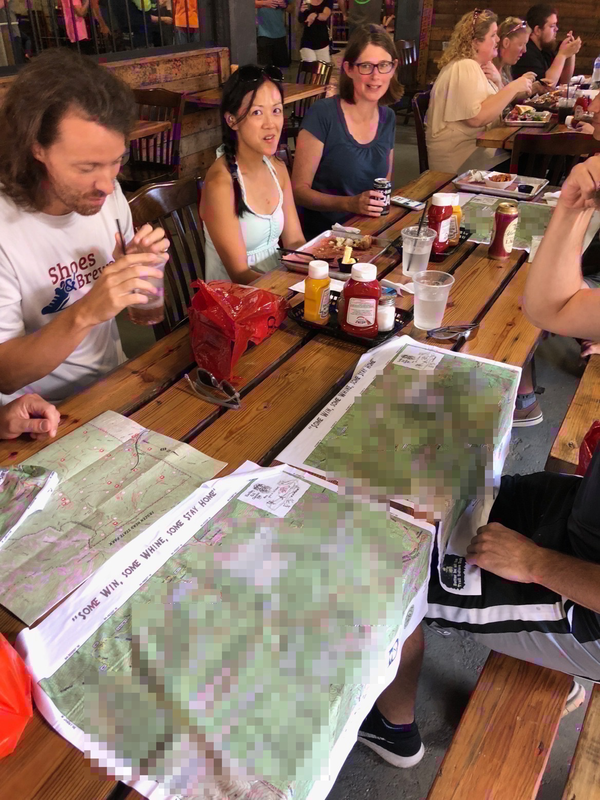 They were especially helpful in finalizing our hiking and backpacking plans, which we would need to alter again based on input from the rangers as well, as to where snow was, etc. I’ll just do a single photo mosaic below but walk you through what we did. After arrival at the B&B, we headed to Teton Village and took the Bridger gondola to the top, which is free after 5 p.m. We had a drink and a bite to eat, and then headed down to eat at the Mangy Moose. The next day, we decided to day hike Amphitheater Lake. We ended being turned back a little over 9000 feet, half mile short of the lakes, due to high snow. We didn’t need to take any chances with Kelly’s knee before we started backpacking! I did go one or two more switchbacks, but the trail wasn’t marked, and there was boot pack going in 2-3 different directions at each one, so decided it wasn’t worth it. We headed back down and ended up at Trappers Grill at Signal Mountain Lodge, which has great deck seating and amazing views. We ordered Reece’s favorite from last time — the huge plat of Nacho’s. Upgraded on DFW – JAC flight! At the B&B in our surprise jeep rental car! A bit chilly at 9000 feet. Reece’s favorite menu item from the trip here 3 years ago. The view from Signal Mountain Lodge. 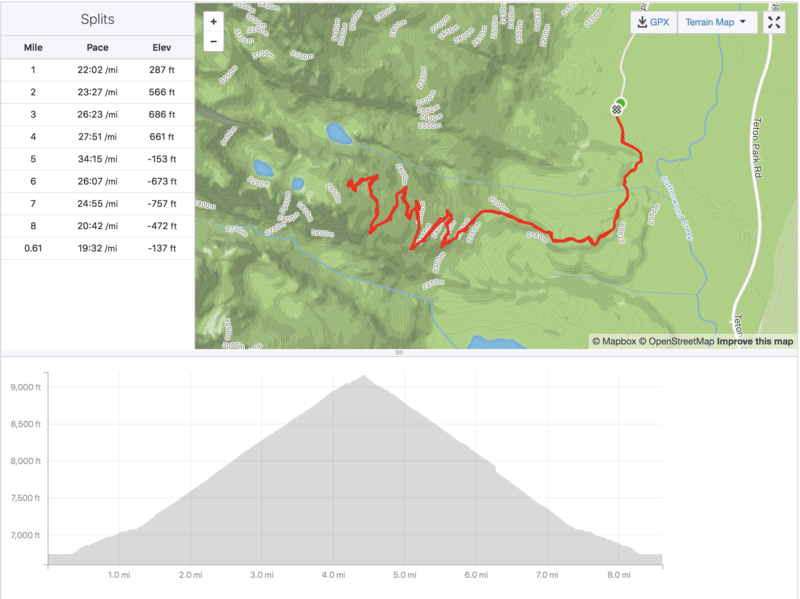 Here’s the Strava info for the Amphitheater Lake hike.